This article is about how to hone a knife with a steel when it is dull already. I'm going to start with a knife steeling; the process of steeling a knife on a standard sharpening steel, what is more commonly referred to as a honing rod. The difference between these rods: while the steel rod only trues and realigns a blade, the ceramic and diamond rods are able to actually sharpen it as well. You might have already know A standard grooved honing rod available in most kitchen sets, and most chefs and cooks have one of these in their home. 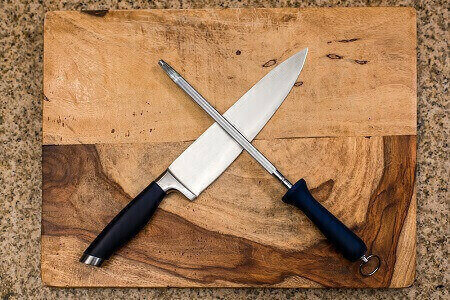 Okay guys, before we get into steeling a knife, I feel it's necessary that I explain exactly what sharpening is versus steeling or honing a knife. Taking a steel to a knife is not sharpening a knife. 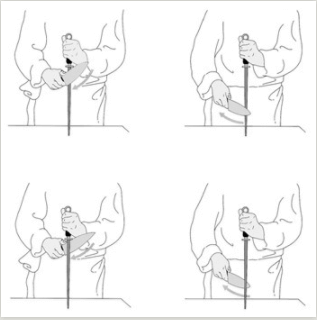 Taking a steel to a knife is realigning a blade. In other words, a blade that's getting bent to one side or the other side, we're rounding off like this where you get shoulder. It's realigning, it's straightening, it's truing, that's what knife steeling is. 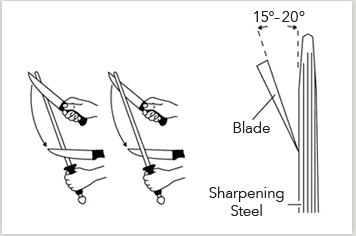 ​Whereas sharpening is when you remove metal from a knife. And that's the key, the removal of metal. When you sharpen a knife and you grind on this secondary bevel to make it thinner and thinner at the primary edge, you're taking metal off, you're making that edge thinner and thinner. Now remember, the thinner that edge is, the sharper the knife is. But also the thinner the edge is, the more susceptible that edge is to breaking. So your angle has to be correct and smooth. And you don't have to use a lot of pressure to realign the edge. Some people use way too much pressure, and what happens is when you apply too much pressure to one side of the edge, the edge rolls up the other way. Another thing you need to consider about steels, and this is something a lot of people don't pay attention to, a steel is made to a certain Rockwell hardness just as a knife blade is. And Rockwell is something that a lot of people don't understand. ​Rockwell has to do with a knife's toughness or steel's toughness and nothing else. It's not a matter edge retention, it's toughness. Now your average stainless steel and average carbon steel knives have a Rockwell of between 56 and about 59, okay, that's standard. Most of the common steels will have a Rockwell between 57 and 62-63. So a common steel will have an effect on this knife. But here's where a lotta people will make a mistake. ​So you have to know what kind of knife you're buying and you have to know what kind of steel you're gonna need. Here you can get the best sharpening and honing steel. The trend today seems to be people want to get to knives of a harder and harder steel, and that's all right, the harder the steel, the longer the knife will hold the edge. So you have to understand where you're going. A knife that's made of a Rockwell 65 plus is gonna have to be sharpened on a ceramic. But you need to understand, standard steel tempered between 56...57 to about 62-63. If you are used to hone a knife with a stone, then this is a little bit different. You hold your rod straight, you put your knife to the steel, and you find your angle. There you have it, the best way how to sharpen a kitchen knife. Although I’ve been talking mostly about the kitchen knives here in this article, this method is also the best way to sharpen a pocket knife.